Time for teachers to form a rebellion against Common Core? I’m starting a new organization at San Leandro High School. It’s called the Common Core Resistance Army. It would be sort of like those 60’s radical groups that were run by ex-con’s. I’ll need a pretty young woman to be my deputy, of course. We’ll preach mass resistance to standardized tests. Why does he dislike CCSS? It costs approximately $13/student to administer the STAR tests we have now; it will cost around $20/student to administer the CCSS. The state superintendent of schools, Tom Torlakson, estimates it will cost California $1 billion to carry out the federal mandates connected to CCSS. By 2018 San Leandro High School will need to invest heavily in computers and computer memory to allow us to give “computer adaptive” tests. In these kinds of tests each student gets different questions based upon whether they got the previous question right. What will you, the taxpayer, get for all this cash? Right now we do nothing but multiple-choice tests. Can you imagine how much it will cost to pay someone to grade those latter questions? Common Core boosters claim that their tests will fundamentally alter teaching. They say that we teachers will be forced to teach “critical thinking”. Common Core will get us to teach “higher order comprehension”. I keep asking myself how this is different from what I do now. The Common Core State (sic) Standards are a fraud. 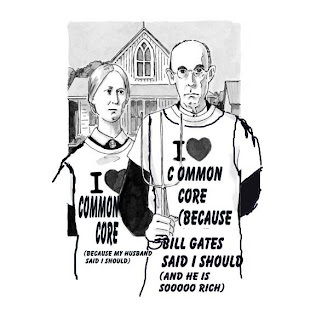 The Common Core State (sic) Standards are a clever way to fleece the taxpayers, to dress up old ideas in new clothing. For this they will charge you, the taxpayers, $1 billion. You would think there would be at least a few teachers, administrators, parents or just plain taxpayers, who would exhibit outrage at these new national tests. But, as far as I can tell, there aren’t. Well, there are some of us out here who have been railing against them for a number of years. The problem? We don't represent the special interests of Bill Gates, Jeb Bush, David Coleman and even the teachers' unions who are making money from the adoption/implementation of the standards. "Can you imagine how much it will cost to pay someone to grade those latter questions?" I think he's missing the long term aims here - replacing what has always been the weak link in the aims of modern education - teachers. I assure you, the software is fully capable of determining what the purveyors of CCSS think is important to quantify (number of concepts, syllables, clauses, etc) out of such answers. At most an admin assistant would be needed, and their costs are much lower than that of teachers. Why are teachers given higher state standards to teach, when psychological and academic test remain the same?